Frantiek Vízner (Czech, b. 1936), Bowl. Apricot glass; cast, cut, sandblasted, and acid-etched. H: 7.5 cm, Diam: 28.7 cm. Czechoslovakia, dár nad Sázavou, 1994. 2007.3.102, gift of the Ben W. Heineman Sr. Family. CORNING, NY.- The Corning Museum of Glass will present an in-depth survey of the work of internationally acclaimed Czech artist Frantiek Vízner. 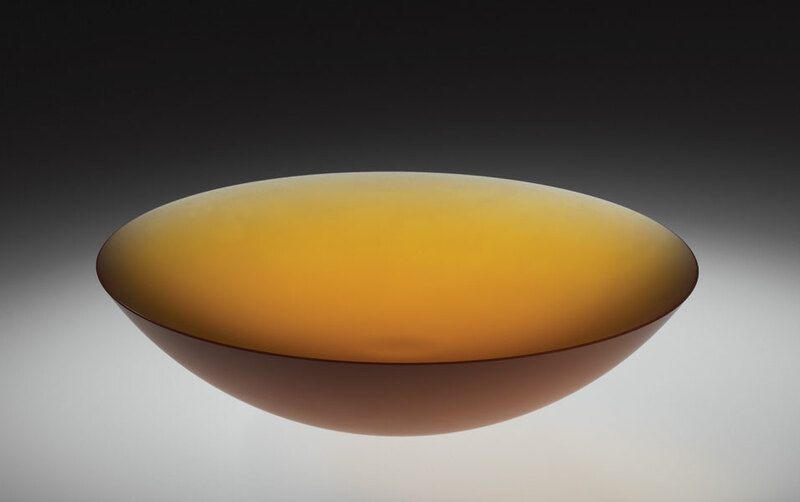 Opening November 1, 2008, Masters of Studio Glass: Frantiek Vízner traces the evolution of the artists work over 40 years, from his early designs for commercial production to his studio explorations of the modern glass vessel. The exhibition features 40 objects dating from 1962 to 2003, drawn entirely from the Corning Museums permanent collection. A range of Vízners distinctive cast and cut studio vessels luminous, minimal, sculptural formsare shown alongside examples of earlier blown glass designs for industry, many of which utilize strong color contrasts and an unusual manipulation of surface and interior textures. Vízner began his training at the Specialized School of Glassmaking in elezný Brod, Czechoslovakia (1953-56) and then studied at the renowned Academy of Applied Arts in Prague. Under the repressive conditions of postwar Communist rule in Czechoslovakia, artists working in glass were afforded greater freedom than those working in other media; abstraction was considered to be less threatening in glass, and other decorative arts, than in painting or sculpture. While working as a professional designer for the Czechoslovak State Glassworks at Teplice (1962-67) and at the Centre for Arts and Crafts in krdlovice (1967-75), Vízner tailored his approach to the material to take advantage of the specialized techniques practiced at the glassworks. However, in some cases, his unapproved designs were produced without his supervision. It was not until he left the Czechoslovak glass industry to pursue a career as a studio artist that he gained more control of the artistic process; full control of his career did not come until after the fall of communism in Czechoslovakia in 1989. Vízners artistic intent is best expressed in his translucent studio works, minimal vessels that occupy the shifting boundary between function and non-function. These reduced forms, with their velvety, acid-etched and sandblasted surfaces, are characterized by crisp, articulated lines and deep, jewel-toned colors. Masters of Studio Glass: Frantiek Vízner will be on view November 1, 2008 - March 22, 2009. The series will continue with a survey of the work of American artist Richard Meitner. Launched in November 2007, Masters of Studio Glass provides a platform for in-depth surveys of individual artists represented in the Corning Museums collection. Inspired by an unprecedented gift of art in 2006 from Chicago collectors Ben W. and Natalie Heineman, the exhibition series is designed to widen the picture of contemporary art in glass for the public and the field.